I've been a full-time livestreamer for 2 years. My internet has been decent over this time with only a few hiccups but every one of them has related to consistent upload rates. I'm on the 150/15 plan, and speedtest shows this as correct. The issue is not with the overall speed, it's that there is poor consistency in my upload rate. This is of course an issue for streaming since you need to upload at a consistent rate. 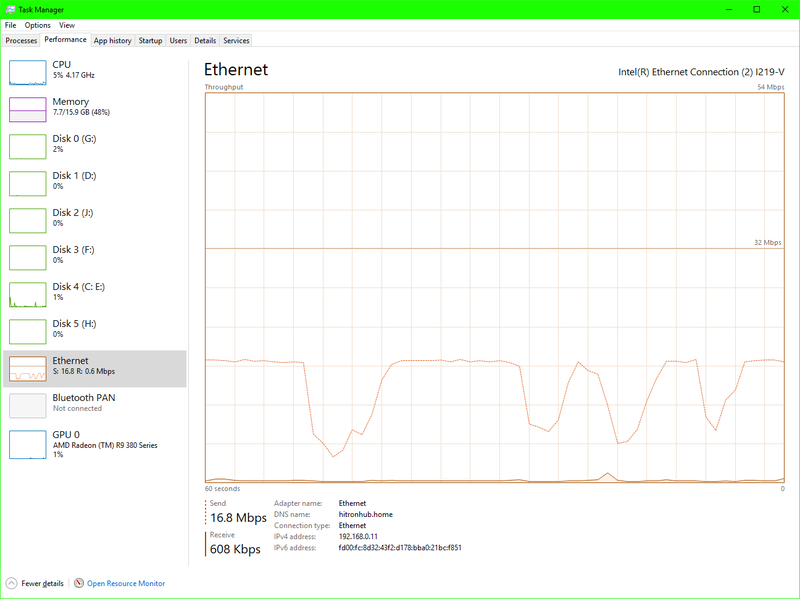 Whether I'm uploading at 1000kbps, or 6000kbps (my typical), the wavering issue still happens intermittently. I want to reiterate that the issue happens regardless of where I am uploading to, it's not a streaming specific issue so it's not on Twitch or Youtube's end, I can reproduce the issue uploading to many different reliable servers. - I am hardwired, the only device on the network and wifi is disabled. - Latest driver updates, everything is clean and secure. - Shaw Tech has visited the residence and checked all signals, replaced an amplifier just in case. - Shaw has checked for area saturation, and the area is clear. - I had this issue last year and Maintenance was sent out with the cherrypicker to tighten and repair lines at the street level. It was fixed for almost exactly a year. - One tech on Twitter support said some of my signals were low at that time, while the tech that was here in person said that they were great. I would really like some help with this as soon as you are able, Streaming is my full-time and only job and I have had to take off a week so far, it's very important to me that I continue to be able to work. I can provide any and all data to you, please diagnose this problem for me. shaw-tony - feel free to loop me in if you think I can help. Twitter team can email me if they want help as well. Thank you, I look forward to a positive outcome! In other news I was able to stream last night with some success. Here are the logs from Twitch specifically to see what time the issues happened at. I'm using Twitch inspector to show the graphs, since they are the easiest to read. I have the same data from Bandwidth monitor but they are ugly charts. I changed games around 6 and restarted the stream. Same server, same settings. So it's unpredictable. Evenings are sometimes the worst, but yesterday the worst time was around 4pm. It's still happening today. Attached are some graphs. This is after removing the powered amp Shaw had installed previously which this tech said may have been causing too much noise. The problem persisted all day after the tech left, so I plugged the amp back in to check with the Twitter team on the levels and they said it's now "37 and the others are at 36 and 33 (not really all that great, pretty weak signal for it)." Plugging the amp back in seemed to make it worse, so I put it back the way the tech left it today. The tech that visited today mentioned that an extreme measure would be putting a street level amp. Is this a possibility? I'm still unable to work today because of this, I would REALLY like some help. Graph below: These were recorded when the tech was here. There was a small break where uploading was consistent, then it went back to it's usual problem. The problem was replicated on another PC and these were taken while using the test router belonging to the tech. Here's one where i just saturate the upload to google drive. Big dips in upload rate showing its inconsistent. I see that a lot of people on these forums are having this issue, is there anything in the works? I get the exact same result uploading to google drive, youtube, dropbox etc and changing server locations on each to test different routes. Thank you for providing more details. I am touching base with corbin to find out what else we can do to help. In several moments, I will send you a direct message to your Community Inbox. Please reply with your home address and phone number to verify your account. Thank you for your patience. I've been having these issues for 6 months.. As a full-time streamer.. Really unacceptable. I have friends who have these issues and they disappear a week later. SIX MONTHS. It's a joke honestly. I had a tech come out who said he doesn't understand anything about this. I'm throwing myself in this thread because OP here knows a lot more about this stuff than I do. Again, it work's for a couple days and I'm able to work and then suddenly it just starts to plummet in upload again. Same troubleshooting- tested on multiple devices, unplugged anything else from the router, attached/detached amp, uploaded to other servers to monitor upload rate, etc. For reference here is a graph and a ping to a streaming server showing packet loss. Tell me anything else that might help you, I'll run any tests from here. On Tuesday, a Shaw tech is coming over to replace our modem with one of the new Arris ones. Maybe it'll fix it, but it's not going to fix our bad signals. I'll have to pay for a new line drop if that's what it takes because I really don't want to have to move because of this. How can I get someone to come out and check the connections at street level? They did that last summer and my streaming was perfect for a year. Here's a video of me uploading to a google drive server. On a good day this graph is nice and flat or kind of like a sin wave--consistent. Looks like the upload is suffering on these too. The issue suddenly stopped around 2pm yesterday and it was relatively stable until 10pm. If there is any way you can see the issues on your end, maybe that small timeline will help. I'm also upload testing this morning and it's looking very rough, so hopefully the same thing will happen as yesterday! So far the issues don't follow any set schedule and happen at any time of the day.